LOS ANGELES — Marian McGlocklin looks like a happy and healthy 2-year-old, but the toddler is fighting a rare and deadly disease. 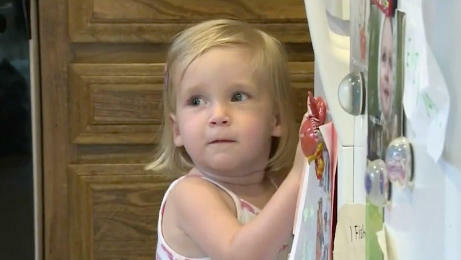 "She has a rare genetic condition called Niemann-Pick disease type C," mom Sara McGlocklin told CBS Los Angeles. "Basically what that means is each of the cells in her body is missing the ability to properly get rid of the cholesterol that the body makes, so it builds up within the cells and eventually becomes toxic and starts to kill the cells." The rare illness affects one out of 150,000 children. McGlocklin said she started noticing a decline in Marian when she was just 6 months old. She was struggling to swallow. Six months later doctors found more dangerous symptoms — an enlarged spleen and liver. "Fat gets accumulated in your cells in the brain, in your liver and in your spleen. Sometimes in your lungs," said Dr. Alvaro Serrano of Children's Hospital LA, who is overseeing Marian's treatment. Marian was able to get into an experimental treatment program — first in Chicago and now at Children's Hospital LA. "The treatment clears the fat that is getting accumulated in your cells," said Serrano. She is put under anesthesia and medication administered into her spine so it can travel quickly to her brain. She is the youngest child receiving this particular treatment in the country. While the treatment is not a cure, the family has seen major improvement in Marian. "It has taken her from not being able to take a single step six months ago to now walking across the room," said McGlocklin. Marian will have to receive the treatment every two weeks for the rest of her life. Researchers hope the treatment will benefit other children in the future suffering from the same rare disease.